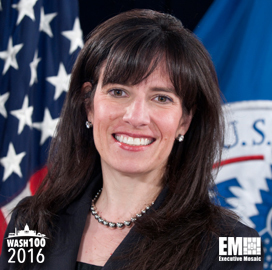 Executive Mosaic is honored to introduce Phyllis Schneck, deputy undersecretary for cybersecurity and communications at the U.S. Department of Homeland Security, as an inductee into the 2016 edition of the Wash100 — Executive Mosaic’s annual selection of influential leaders in the government contracting arena. Schneck, DHS’ lead cybersecurity official, spoke at a Potomac Officers Club event in October 2015 to describe how DHS collaborates with the private sec tor to bolster security of U.S. physical and cyber infrastructure as well as the department’s potential role in a government-industry data exchange system. “DHS needs to be the port to connect the dots, paint the picture and share with our agency partners and companies,” she said. Last year, the department proposed a strategy to centralize sharing of threat information between agencies and companies through the National Cybersecurity and Communications Integration Center and set a goal to integrate big data and predictive analytics in the agency’s development of a weather map-like system for cybersecurity efforts. Schneck, who made the Wash100 list last year, came to the department in August 2013 from her previous role as vice president and chief technology officer of McAfee‘s global public sector business. She also previously held technical positions at Computer Sciences Corp., IBM, MITRE, CygnaCom Solutions, NASA and the University Of Maryland’s meteorology department. 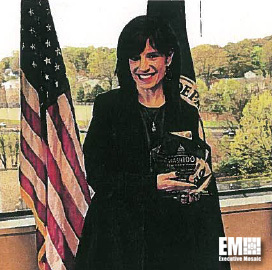 Her career also includes chairmanship of the National Cyber Forensics and Training Alliance’s board of directors, the InfraGard program national board at FBI and a cybersecurity working group under the Center for Strategic and International Studies. 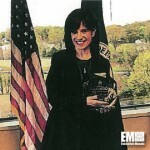 Executive Mosaic congratulates Phyllis Schneck and the entire DHS team for their selection to receive this award.